4 at the opposite half of the court. If 1 cannot receive the ball, 5 passes to 4 and 4 passes to 1. 2 and 3 run close to the sideline. 1 dribbles to the middle. 4 and 5 are trailers. 1 passes to a side. The wing from the other side goes to the base line. 4 cuts to the ball side and tries to receive the ball. 5 is the high post. 2 can pass to 4 or 5. If a post receives the ball, the other post must cut. If 4 has the ball and he cannot shoot, 5 cuts to the basket. If we don't pass to the posts. 4 goes to the opposite side and 5 becomes the low post. 2 passes the ball to 1 who cuts to receive the ball, and 3 takes the place of 1. 2 goes to the baseline and cuts to the opposite side. 4 and 5 set blocks for 2. 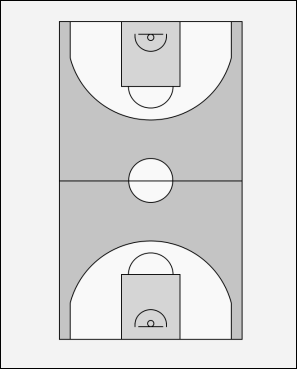 2 can shoot or go to the basket. If not open reset the offense.